Want to get a sales rep’s complete, undivided attention? Bring up their compensation plan. Few things have such a direct, immediate impact both on reps, personally, and on your business as a whole. It’s crucial that you get your comp plan right — not only to ensure your reps are motivated, but to ensure they’re motivated around the right activities that are truly going to move the right needle for your business. Get it wrong and your business could wind up paying the ultimate price. How do you choose the right comp plan for your business? 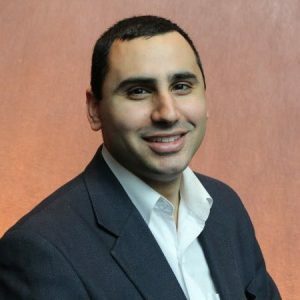 Yes, you can try diving into competitor research, but as sales strategy consultant Michael Hanna explains, that can often be tough since titles and other factors can vary so greatly. The best approach, Hanna advises, is to start by looking at what you’re trying to accomplish with your compensation plan, and establishing priorities and parameters to work with from there. Before you dive in, Hanna says it’s helpful to take a few steps back first and recognize that your comp plan is one thing to you and another to your salespeople. Get them paid. Or, in other words, to help them fund personal goals (that’s why they get so personally invested and involved when it comes to compensation changes and discussion). With that in mind, Hanna recommends you begin laying out your comp plans by ironing out the base salary and variable compensation for each role. The higher for each, the greater the base salary will typically be. How complex is your sales cycle? How much influence do reps have on the buying decision? Is your model primarily inbound or outbound? Is the focus of the role primarily hunting (outbound), farming (growing existing business), or catching (inbound)? Standard Commission Rate: Reps receive their target earning when they hit their quota. Sliding Scale: This is typically used to help accelerate sales up front. Essentially, you’re offering to increase the commission rate once a rep surpasses a certain amount of deals/revenue. 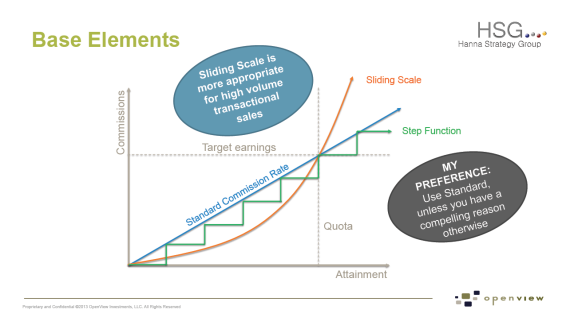 A sliding scale is more appropriate for high volume transactional sales. It doesn’t make sense for sales models focused around a small number of larger deals. Step Function: This is basically in-between your standard and sliding scale models. Reps have to pass certain thresholds to get bumped up to higher commission levels. Hanna’s advice: Use a standard commission rate unless you have a compelling reason to do otherwise. It’s by far the most common for a reason. When in doubt, keep it simple. The next decision to make is whether you want to include a floor or ceiling. Floor: One method some companies utilize to incentivize stronger performance is to make it so reps will not earn anything unless they pass a particular threshold. This approach is also typically more appropriate for high transaction sales. Ceiling: This is simple, Hanna says. Never use a ceiling. If reps want to make a ton of money for the organization why would you get in the way? Bonus: Reps surpass their quota, they get a lift. Accelerator: Once a rep passes a certain threshold, his or her commission rate will increase. Companies will sometimes implement accelerators to avoid salespeople holding back deals once they’ve already hit their quota. The problem is you can start paying out disproportionately more commission compared to how much revenue the rep is actually bringing in. 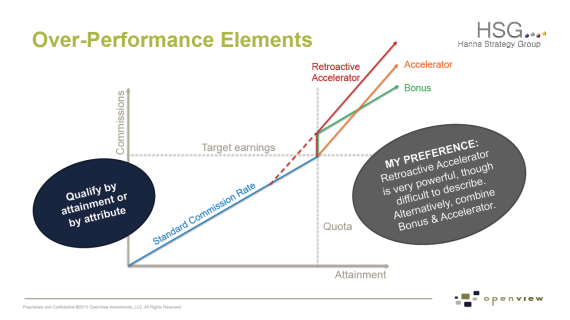 Retroactive Accelerator: If a rep surpasses quota, the company retroactively gives them a higher commission rate. This can be a very powerful motivator, Hanna explains. It pushes reps to exceed quota and not hold back deals. When designing your comp plan you should always keep in mind your bigger-picture sales goals and let those guide you, Hanna says. Sales departments at SaaS companies, for example, may have a primary goal of contributing to monthly recurring revenue (MRR), but may also have a secondary goal of increasing profitability, therefore lowering the average discount. Paying base comp on MRR attainment, but also introducing an accelerator based on extended term deals. Ex: For every 2-year deal, the rep will make an additional 25%. For every 3-year deal, an extra 50%. “By combining compensation modeling elements you can incentivize for secondary results without deprioritizing your primary components,” Hanna explains. Say you have a BDR whose primary responsibility is to generate new qualified leads. That’s what you’re paying them for. While quantity may be the primary component of their compensation, you of course also want to balance that with also incentivizing higher quality leads. How can you do it? In the alternative approach, you have a way of maintaining the priority of the primary component — number of new qualified leads — but you’re equally emphasizing the quality of those leads. 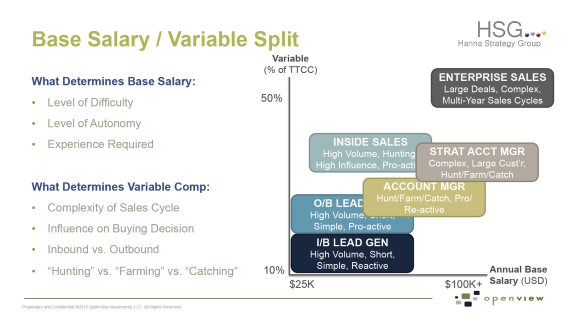 Looking for more tips on how to design and implement an effective sales compensation plan? Watch our free on-demand webinar Show Me the Money: Sales Compensation Plans that Won’t Fail. Get access to the full presentation video and slides here.